Rationale : RCT by established surgeons means that the results of RCTs during the learning curve are not accepted eg a RCT on laparoscopic hysterectomy with durations of surgery longer than 180 min. Established surgeons are those with an international or at least national visibility as evidenced by live surgery, congress presentations and the appreciation of their peers. eventually an hyperlink to your/hospital website. 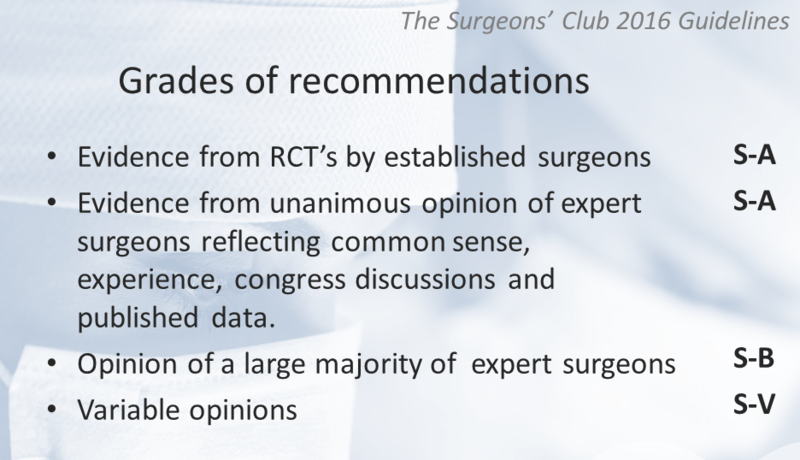 Guidelines by surgeons reflect the available evidence together with surgical experience. In the absence of evidence the surgical experience remains valid until proven otherwise. Existing EBM guidelines for endometriosis as the ESHRE guidelines (1) emphasize the evidence of RCT (A, B, or C grade) and dismiss what is not ‘proven’. Their recommendations based on expert opinion are weak, which is not surprising since only 3 Of the 14 authors can be considered endometriosis surgeons. For clinicians and surgeons these guidelines are biased and not very useful for clinical decision making. Important aspects of surgery are practically impossible to demonstrate. It is impossible to demonstrate that lesions were missed during surgery, unless a repeat laparoscopy is performed which is not possible for ethical reasons. It is impossible to judge quality of surgery unless video-registration of the entire surgery is available. It is close to impossible to organise blinding in surgery. Many trials would be unethical to perform. Therefore guidelines by surgeons with a large expertise in laparoscopic surgery are needed. To the available evidence surgical experience, rare events as prevention of complications and surgical strategy will be added. The model is based upon our experience in reviewing the diagnosis and treatment of deep endometriosis (Fertil Steril 2012) and for the article on epidemiology of endometriosis in press in Gynaecological Surgery. It moreover will permit the valorisation by a much larger list of surgeons which in publications are limited to some 5 authors plus the acknowledgements. We expect that one day Societies as ESGE, AAGL and Society for Reproductive surgeons will publish these guidelines.